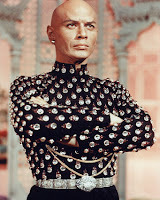 Yul Brynner with his shiny bald head and colorful outfits hopped across my TV screen with much regularity in the '70s and '80s . The voice over for the commercial would declare with some urgency, "only 2 weeks left to see The King and I at the Orpheum Theatre, starring the legendary Yul Brynner! Get your tickets today!" I never saw the show, but I was convinced that it must have been out of this world incredible. Yul looked so wild and sexually manic, and he was surrounded by leagues of gorgeous young Asian women. Lucky Yul, I used to think. Originally conceived by Gertrude Lawrence as a vehicle for her return to the musical stage, The King and I was based on Margaret Landon's novel, Anna and the King of Siam. After Cole Porter declined the project, Miss Lawrence turned to Rodgers and Hammerstein who quickly agreed to write and produce it. The story is set in Bangkok in the early 1860s and tells the story of Anna, an adventurous Englishwoman hired to serve as governess and tutor to King Mongkut's many children. Although Anna has many quarrels with the dictator, the two eventually fall in love, and her influence on the king helps to democratize the country. The role of the king was turned down by the likes of Rex Harrison, Noël Coward and Alfred Drake. Finally, a virtually unknown actor named Yul Brynner was given the part and through the sheer force of his personality, without any change in the script, managed to switch the dramatic focus of the play from Anna to the King. Brynner's name has since become virtually synonymous with the role of King Mongkut. Palo Alto Players is currently showing their version of this infamous Rodgers and Hammerstein musical through May 10th at the Lucie Stern Theater. The show features, Kerie Darner as Ana, and Don Masuda as The King. Director Bill Olson, presents a very tame, funny, and family friendly King and I. Lots of nice music, a beautiful set, and fun performances make this a pleasant theater experience. Personally, I would have really been excited if Players had taken a risk and made the King darker and more menacing, and if they had created some real chemistry between the King and Ana. It was all just too Disneyesque for my taste. There was a moment of raw emotion near the end of Act II when the King nearly pummeled a young concubine with a bull whip, but it all ended pretty suddenly. If you're looking for something fun to do that will leave you feeling cheery during these difficult times, go see this show. There are a dozen or so of local children who ham it up and provide numerous cute and hilarious moments. Bring the kids and grandma. They will love it! I love this clip from Britain's Got Talent, because it points out something that we are falling victim to with the advent of reality television. Everyone assumes that just because this woman named Susan Boyle is a villager with no makeup that she can't sing. Think again. She has a beautiful voice. The thing that really bothers me about American Idol and the other shows of their ilk is that they pit the auditors against the talent. When a performer goes to an audition, usually, the auditors are hoping the person shines. However, with these shows, an atmosphere of judgment and even cruelty dominates. That's why I just love this clip, it just lays bare the charade that these shows have become.